It has been so long, I did'nt posted any photograph images. But now it's my turn to post a photograph images again. On this post, I want to show you some unique photos. 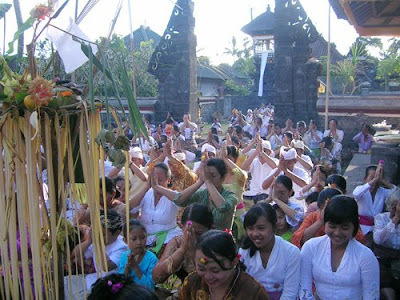 It was a holy ritual on Balinese Culture, named Rahinan Gede or Piodalan on the temple. The Rahinan Gede was held for about once a year, an annual ceremony. 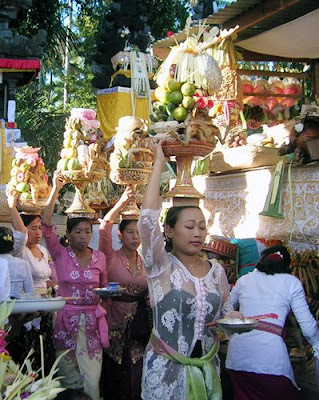 When it was held, all of the Balinese make a offering to be presented for the God, named Banten. May be its name is so foreign for you, because you seldom hear about this. The photo above shown the Balinese was having a praying time on the temple. It's very classic I though if it compared to this era. 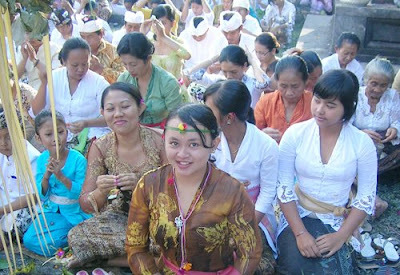 On this photo you see a women bring the Banten by putting it above her head. The Banten contains some fruits like apple, mango, orange, and the toasted chicken in front of the fruits. 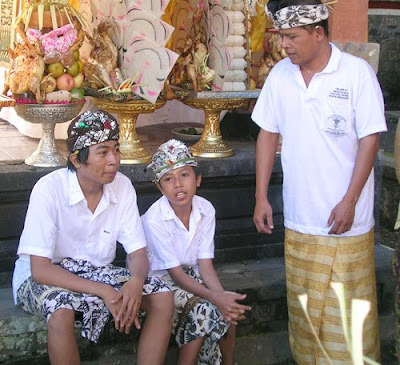 These two last photo is showing a Balinese people who have finished their ritual. Usually before they go back home, there are some unique habitual like share some fruits and some other offering ritual to each others. This habitual built a tight relationships each others between the Balinese. Thanks buddy for sharing the useful and informative post with us. The underground club really looks interesting to have a good time. Something really unique in the holy land. The second image is very charming and professional . Those are looking very spanking .